Crispy on the outside and tender on the inside, this salmon is one of my favorites. And the Terragon Sauce is delicious. Dovetailing Tip: When preparing the spinach , wash and dry 8 additional ounces in preparation for the Meal 3 Spinach Salad. Add the salmon to the pan skin side down and saute until golden brown on both sides, about 4 minutes per side. Melt the better in the same pan. Add the shallot and the tarragon and saute for 30 seconds. Add the spinach and toss until wilted. Add the wine and deglaze the bottom of the pan. Add the cream and simmer until the sauce thickens, about 3 minutes. 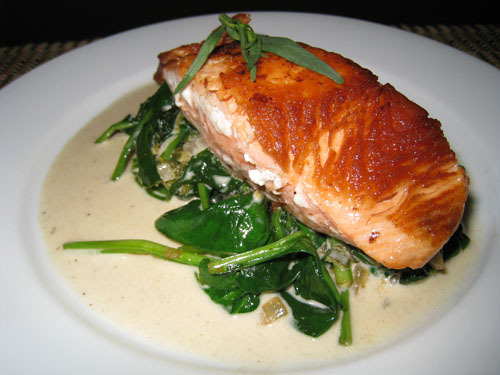 Place the salmon on the spinach and pour the sauce over.